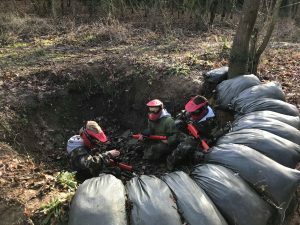 Paintball Chelmsford: We offer Adult paintball, Childrens Paintball and Laser tag all within easy travel of Chelmsford and Braintree. 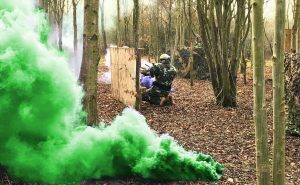 If you are looking for site to play paintball near Chelmsford then look no further. We have two paintball sites covering the Essex area. Each around 30 minutes from Chelmsford offering easy access by road. Our Harlow site is just on the Herts/Essex border. Whilst Basildon is at Wickford. Both easy to reach with great transport links. We offer adult paintball, childrens paintball and Laser tag. All ages are welcome from 8 years. Adults paintball is available for all players aged 11yrs and over . More details on our paintball and pricing can be found by clicking here. Kids Paintball is specifically for 8-11 yrs olds. It allows kids all the excitement of paintball but in a more controlled, low impact, environment. Minimum number of 10 players are usually needed to guarantee your date. You can find more information on childrens low impact paintball by clicking here. Laser Tag is available at both sites for groups of 10 players or more. This game is ideal for younger players (8yrs+) and corporate team building days. You can click here for more info on Laser Tag Games. Our site, close to Harlow, is just 19 miles from Chelmsford and just over 20 miles from Braintree. Set on the Herts / Essex Border, Harlow has 60 acres of woodland and was once used as a ww2 airfield. The location is easy to access via the A120 and the A414 as well as A10 and M11. To see information on Sawbridgeworth location close to Harlow click here. Our Basildon site is at Wickford. and easily accessible via the A127 & A130. It’s easy to find and open 7 days a week. You can find more information on Basildon Paintball by clicking here. Want more information or ready to come join us. Get in touch via our contact us page or you can book online by clicking here. Your local site for Paintball in Chelmsford and Braintree!